One hour quad bike experience with 30 minutes of driving time, on a purpose-built track In Hazlewood, North Yorkshire. This North Yorkshire quad biking experience day for two people is a fantastic 60 minutes of motoring madness that will see you blast your way around a purpose built off-road driving circuit on a burly, powerful quad bike. Quad biking is a great way to get out there and enjoy the great outdoors, the perfect combination of fresh air and motor mayhem! This off road quad biking experience is a brilliant and really unique gift idea, and a fantastic activity for a stag party, birthday party, or corporate team building event. Your experience kicks off at the Hazlewood Quad Biking location in North Yorkshire, where your friendly and enthusiastic guide will deliver a safety briefing and introduction to the experience, and an introduction to the quad bikes of course! You and your group will then jump on either a Yamaha or Eton quad bike, and the instructor will take you through a few simple exercises to get you used to the bikes. Once you are all capable and comfortable, you'll head off on Quad Bike safari with your instructor leading you round the incredible, fun, and challenging course. As you make your way around the circuit you will come across some extra challenges - some hill descents, a balance beam, and 'quad bike limbo'! With around 30 minutes of drive time, you and a friend have plenty of time to work on your off road skills. There are three different circuits, ranging from easy to difficult, to ensure you are constantly challenged during your quad bike experience - so get out there in the gorgeous North Yorkshire woodlands and experience Yorkshire quad biking! The North Yorkshire quad biking experience is available 7 days a week, with both morning and afternoon booking slots available. This is a 60 minute quad biking experience with approximately 30 minutes drive time. Please note that larger groups may mean a slightly longer total experience time. Participants: The Quad Biking Experience Day for Two Hazlewood, Yorkshire is for 2 participants. The quad biking experience has a minimum group size of two. Wear old trainers or boots and clothes that you don't mind getting muddy! All necessary safety equipment will be provided for you at the Quad Biking centre. The weather should not affect your North Yorkshire quad biking experience except in very severe conditions. If your experience has to be cancelled due to bad weather, you will be able to reschedule for an alternate date. This week our Expert Interview comes from Marc at Live-For-Today Activities. Known as ‘Yorkshire’s Best Adventure Company’, experiences range from gorge-walking to archery to quad-biking, all designed to make you feel alive! 1) Please explain your journey as ‘Live-For-Today Activities’ so far. 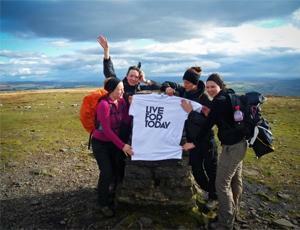 Live For Today was founded in 2011 by Marc Wise and Dan Miller, both of who have a huge amount of experience in the great outdoors and thought that things could be done a little differently and a little better. The perks of our job are to be doing what we love everyday and always working with people who are at their happiest because they are doing something exciting that they have been waiting to do for a long time. Everyone in the outdoors is great fun and each have their own unique character. You never find two climbers who are the same! Every day brings a new challenge whether it is planning for a busy weekend or how we are gonna fit all this kit in one car…its all fun!!! There aren’t many because we are such a young company. We have been in local paper, radio etc and got shortlisted for the best small company of the year this year, unfortunately we failed to win but there is always next year. Also, we’ve had Neville Longbottom from Harry Potter come air rifle shooting. Our most popular activities are buggy racing, quad biking and aqua zorbing. Aqua Zorbing allows you to experience how it would feel to be inside a washing machine….an amazing and unique experience. Our plans have been set from the start and that is to become Yorkshires best adventure company, we’re not shy about expansion and when we have achieved this we will be venturing into other counties to duplicate what we hope would be a winning formula. We have recently started an online shop that we hope to grow alongside our business, this sells our own merchandise along with other unique and funky products that we think people will love…check it out!!! When Aqua Zorbing do you use cold or warm water??? The answer is you will have to find out….